NUCCA is an acronym for the National Upper Cervical Chiropractic Association and is a specialized form of upper cervical care. Unlike traditional chiropractic care, upper cervical care uses a highly specific, light and controlled force to restore misaligned spinal bones to their proper position allowing the nerves to functional optimally. Dr. Goffe is one of only about 10-12 doctors in Ohio that perform this procedure due to the number of hours it takes to learn and perfect this technique. Though he is certified in a wide array of chiropractic techniques, Dr. Goffe has never found a technique that is safer, more comfortable or more effective than the NUCCA procedure. This technique is over 50 years old but is constantly updated with ongoing research. 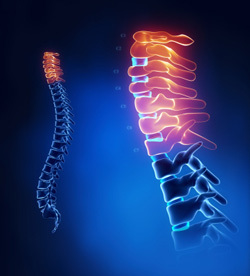 The technique was originally taught by Dr. Ralph Gregory who worked with another pioneering researcher in the chiropractic field — Dr. John Grostic, Sr. Other similar techniques based on the same model include Atlas Orthogonality and Orthospinology. What Is the Adjustment Process Like? During NUCCA care, patients lie comfortably on their sides. Dr. Goffe applies a gentle pressure behind the ear at a bone in the spine. There is never any turning or twisting of the head and neck in this procedure. In fact, it is one of the safest, most comfortable and most effective techniques in chiropractic today. Check out our interactive tool to see what a misaligned spine looks like and how gentle NUCCA adjustments can help. Like other chiropractic techniques, many factors influence how much care is necessary. With NUCCA, a high degree of specificity is used to make corrections. We often see patients responding more quickly than with other techniques Dr. Goffe has used. If you would like to experience NUCCA care, contact Goffe Chiropractic Center today to book an appointment!